BUFFALO, N.Y. – The Telephone Consumer Protection Act (TCPA) makes it illegal to place calls using an automatic dialing system to cell phones, residential phone lines, or phone numbers paid for by the recipient that would result in a fee to receive an advertising or collection call. The TCPA notes that each instance of illegal contact will result in a civil fine of between $500 to $1,500, depending on the willfulness of the misconduct. Therefore, illegally auto-dialing contacts could result in substantial fines. 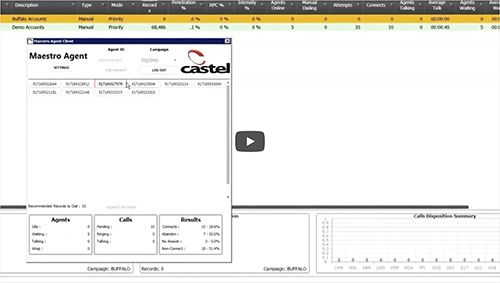 Castel Maestro’s unique design optimizes right party contacts between Agents in your contact center business and customers. The solution improves the speed and quality of each contact, generates data for analysis, and ensures TCPA compliance. Castel Maestro cannot be converted into an auto-dialer. Beyond TCPA risk mitigation, state and local compliance, and enhanced productivity advantages, Castel Maestro offers a range of unique capabilities in the areas of detailed reporting, campaign strategy, and time zone validation. The solution allows for constant monitoring of system and agent performance, giving supervisors the ability to make adjustments as needed. Additionally, managers can review customer interaction outcomes and develop future calling strategies using data generated by other elements of the Castel solution suite. For more information regarding Castel Maestro, please visit the Castel Maestro solution page, the Castel Maestro FREE demo page, or contact Steve Felano at sfelano@castel.com or (518) 852-1863.